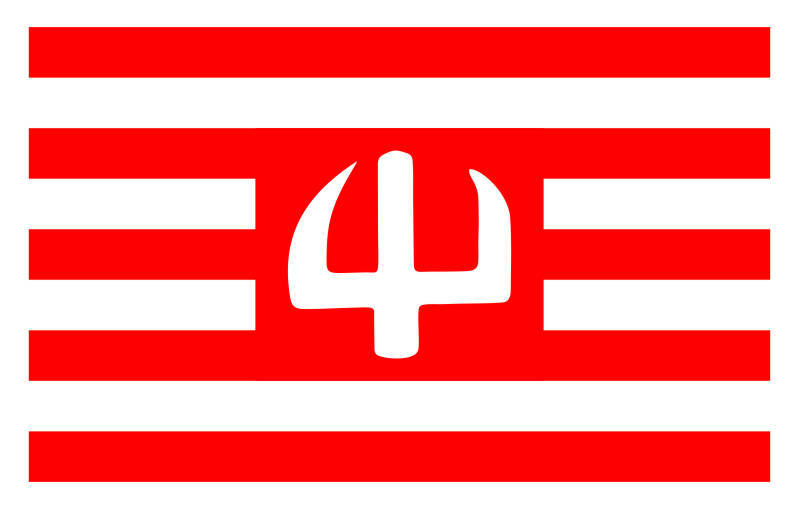 Using colours of the Culm Land Banner that represented the Prusian knighthood, adding digs of the Russian archaeologist Kulakov of the oldest Prusian symbol from the VII-VIIIth century, the Prusian colours of the flag with the Trident was designed by Slawomir Klec Pilewski and graphic design worked up by Justyna Barwina-Myszka. 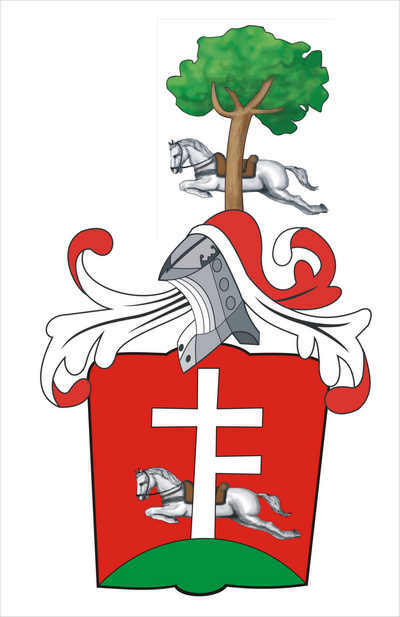 Coat of arms Prus IV designed by Mr. Robert Kostecki and Mr. Lech Windak, artwork worked up​​by Mrs. Justyna Barwina Myszka, with this symbol today's Prusai have the right to identify themselves. 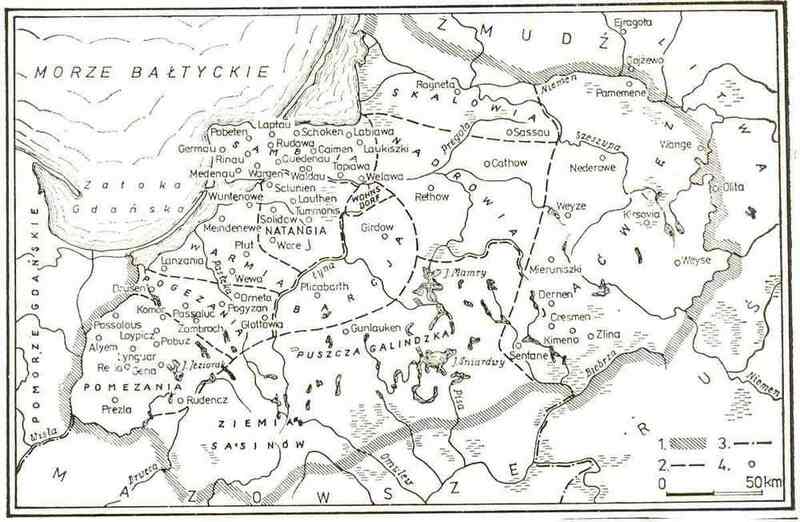 The present map of Poland showing the XIVth century dispersion of the Prusai, according to prof. Jadwiga Chwalibinska drawn by Mr Leszek Windak. Poland is the place where the largest number of the Prusai descendants are living, their identity well known without a special investigations. It is very important that the ancient culture and the history of Prusai, presently a large part of the Polish society, with its roots in the land of Warmia and Mazury within the border limits of Poland, should be finally extracted for to-days light and publicly shown. The knowledge of it should not be hidden, dispersed, placed and stored in the basements. 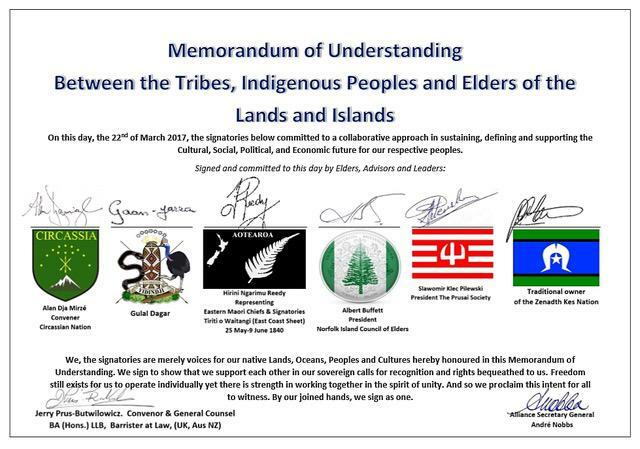 Why the history of this land and its cultural heritage is not being let known? 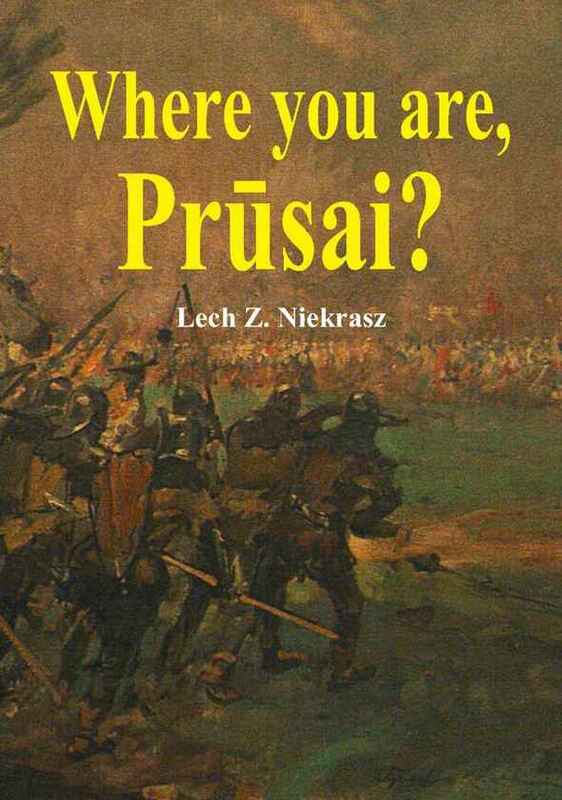 BOOK “WHERE YOU ARE , PRUSAI ?” ENGLISH TRANSLATION COMPLETED. It is worthwhile spending a moment to consider the problem which emerged after the conclusion of the second world war. It concerns the naming of the part of the former territory of Prusia, which was incorporated into post-war Poland. In view of the unfortunate traditions of German Prussianism and the associated worst possible memories, nobody wished to call this territory Prussia although it was to a substantial degree still inhabited by the indigenous descendants of the ancient Prusai, who saw no need to leave the land of their forefathers and talked of themselves us “ We are not Germans but we are also not Poles, we are locals”. After the war Stalin carried out another successive crime by ordering the deportation to Germany tens of thousands the descendants of the Prus people from the territory annexed by the USSR, the so called Kaliningrad region. A similar fate awaited the inhabitants of the territory incorporated into the Peoples Poland with the only difference that because of the discrimination against them the “locals” felt obliged to leave their fatherland and emigrate to Germany. This was also a crime on the living body of the population. Accordingly these lands, on which the Prus peoples lived on for over a thousand years before the appearance of the Slavs on the territory of to-days Poland, now carry the names of Warmia and Masuria. It is meanwhile known that, as a result of the efforts undertaken by the Teutonic Order in the XIII century the victims of the invasions, which bore all the hallmarks of racial extermination, some 50% of the population of the then Prus lands perished, and the further 10% escaped the Teutonic sword by fleeing to neighbouring Poland or to Lithuania or Rus. The Teutonic Knights also placed their subject Prusai in the first line of battle in their wars of conquest, sometimes forcing them to carry out the most bloody work. From the year 1331 comes the information that during the battle of Plowce the Prusai refused to carry out the Knights orders to murder the Polish prisoners taken captive. According to available sources the Order forced 5 thousand lightly armed Prusai to appear in 1410 on the fields of Grunwald who did not show the required fighting spirit, and many of whom sympathised with the Polish Crown. 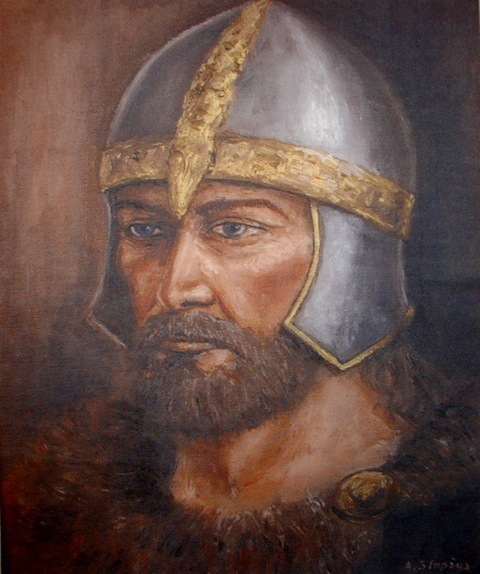 Their help to King Vladislav Jagiello is still little known, who due to them disposed of information about the location of the Order’s forces and because of this could locate his Polish and Lithuanian armies in the most advantagous positions. The attention of Polish historians by passed the part played by the Prusai Culm Standard brigade, whose influence on the result of the battle of Grunwald was thought by the German historians to be reason for the defeat of the Teutonic Order. The pages of history do not dwell on the fact that after Grunwald Prusai knights captured the Knights castles to turn them over to the Crown. The Prusai had to pay a very high price for their part in the Thirteen Years War (1454-1466) where they also stood on the side of the Polish Crown. Their part in this was however dismissed by the Polish side. There were also incidents which indicated a negative attitude for the Prusai. An example of this was the attack by Piotr Dunin, the commander of the Crown forces, on the cavalry unit of 60 horsemen sent to help the Polish King, which was forced to return. 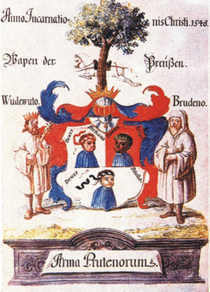 The Polish side helped in the bloody surpression of the Sambian revolt of Prusai peasantry in 1525, supporting the German side. In December 1943, during the Tehran Conference, Winston Churchill proposed a permanent separation of Teutonic Prussia from Germany and harsh treatment of the inhabitants of the Prussia. There was no mention of indigenous ancient Prusians. Further he said: "other Germans are not so savage and cruel". Saying: "let them live in tolerable conditions. As one generation passes completely change its nature. Southern Germany is not aggressive enough to start a new war. We have to make sure that the oblivion of Prussia comes out in favor of them." With these phrases is obvious that after the war, there remained on their land indigenous Prusians residents who were treated like Germans and not as native Prusians. In other words one can conclude from the above statements that German settlers genetic descendants of the Teutonic Knights are Brandenburgians with a criminal past on the ancient Prusai people. From the above reasons the land was purified from the indigenous people of Prusai and settled by other resettled people. It escaped the attention that the majority of the descendants Prusai people live in Poland and their number exceeds two million of them. They participated in all fields of Polish life eg. social, cultural and military and did not receive any recognition. The below offered book is a first of its kind where unfalsified knowledge, their history in short with illustrations is compiled for the reader. Therefore you are invited to read it. Few people know, that the immortal Chopin Mazurkas long before Kurpie were playing, descendants of Prusia. The Prusian descendants are distinguished in the Polish history , science , literature , defense, two Nobel prizes for Poland, the Prusai is the hero of the Polish National Anthem. No need listing them all, because it's not about to ennoble the Prusians, they have no such a need . It is only to prove that the Prusians were and are present in Poland , and are still alive. Each state in Western Europe with such cultural heritage would have bragged with that. At the moment we are having such a Government which unfortunately does not allow for the Prusai culture to be known. Two and a half thousand years of history of Prusia should be the heritage of the Polish Republic , especially as the greater part of their land is owned by the Polish State , which believes that this land is their Motherland . How is it possible they are hiding everything that belongs to the history of this land. and later gained a lot of castles to the Polish King. Is it right to demand our right to obtain media time on TV to promote the culture and history of Prusia? Is it right to demand our special protection and exposure of Prusian culture monuments, and the dissemination of the knowledge about their history? Is it right to acquire a piece of land for the Prusians, for the general public's access and activate a showcase of the Prusians culture? The present Polish Goverment ignores all the pleas and it seems that the recognition of these demands would give an evidence of their high knowledge and culture.
" At a meeting with journalists, President of Belarus Alexander Lukashenko said that he had asked Vladimir Putin of " putting the Kaliningrad region " Belarus and the Russian president agreed - gives " The Republic " for the BBC. According to Lukashenko , the conversation , in which Putin has promised to enlarge the territory of Belarus to Kaliningrad took place during a helicopter flight over Kaliningrad . - Kaliningrad was actually a Belarusian - said Lukashenko . 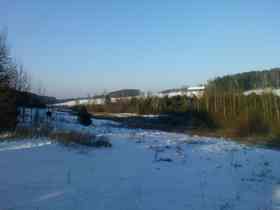 According to "The Republic ", the Belarusian president lamented that in the Kaliningrad region the land is not plowed . He promised , however, that Belarus will transform it into a thriving country . Lukashenko also expressed the hope that the Lithuanians , which separates the country from Kaliningrad Belarus , will not mind taking over the territory by the Belarusians. According to "The Republic " for Russian television NTV , the Kremlin has not commented so far the words of President Lukashenko . Now that it is the right time for us to go on the International Forum, here are some historical facts for the Prusai. The Kaliningrad Region ! ! ! 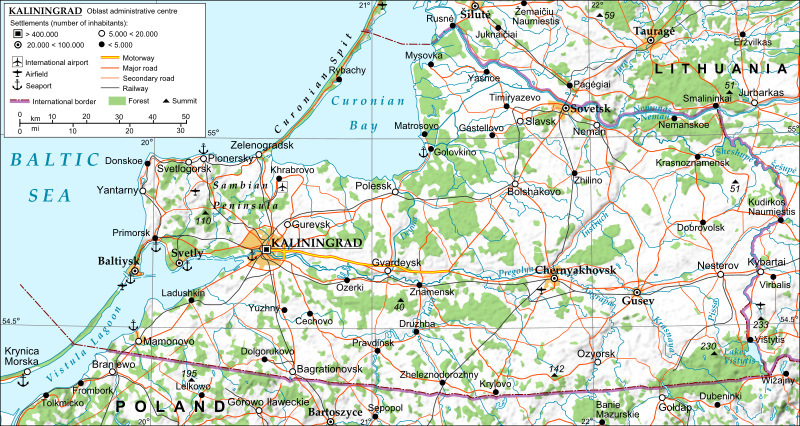 The Kaliningrad Region was never officially been passed over to the Soviet Union after the Second World War, as their integral part. There is not even a document granting them the administration of this Region. During Churchill’s visit in Moscow, circa 1943, he passed Poland to Stalin with the Kaliningrad Region, saying, with Germans in that Region you do what you want. In Yalta this was officially clinched with Roosevelt. No one noticed that about 200 000 indigenous Prusai in the Kaliningrad Region were not fleeing from the Red Army. The Red Army had never heard of the Prusai people, and Stalin exterminated the natives from that area. After year 1948, there have been no more Prusai people left in Sambia. The presence of Russia in the Kaliningrad Region is without legitimacy, and only established by Stalin by the law of force. We will stand up for the creation of symbolic territory with the population density of the indigenous Prus people, and their descendants. The world of to-day, is still determined by force. 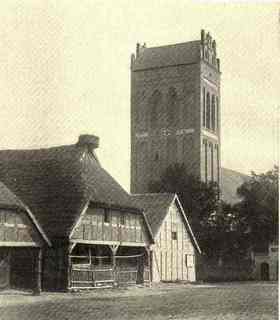 The Germans and the Russians have their own plans for the Kaliningrad Region, for which the Prusai waited seven hundred years, and we wait and also have our plans. We can not allow for any longer seeing the trading with the Prus land. We neither the Germans nor Slavs and neither of them intend to recognize our existence. As it is now in Germany and Poland. However, they very eagerly use and trade the land of our ancestors, because they themselves do not believe that it will remain with them. 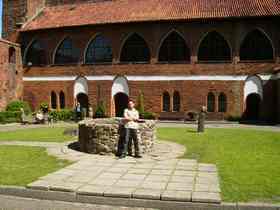 We must act before the land will be established something like the former free city of Gdańsk. Sambia must be free for the Prusai, so that our grandchildren will be proud of us, as the Prusai they had never ever have surrendered. Each of us ought to take part in the referendum, thus will show our steadfast Prusai roots. Historically, there was no such chance as there is now, therefore let us stand up for the recovery of our two and a half thousand years of history. We can and we are ready to stand up without compromising to the International Forum and to the United Nations for the return of the Prus land of the Sambia. For that we have a professional force. There is one condition. In the Referendum that we announced, we need a number of roll-call support. We look forward to the reporting of everybody, all of you descendants of the Prusai. On receipt from you a quorum, allow us to initiate immediate action at the UN and the European Human Rights Organization. Please report by name with all your family members, wives, children. Please let it be known about the Referendum to all those who do not have the internet. No one will help us, but ourselves. Are you a senior ? Every vote is very important, and perhaps this one most important for the future, that your grandson even if will not want to settle on Prusai soil, will have a reference to the Prus culture. Do not let them say why Grandpa did not sign up with his Family. Think of referendum as an epoch-making event. In the light of the International Law we are right and very right to claim the Kaliningrad Region, the land of the Prusa. The Sambia must be recovered . The Prusai name for Kaliningrad have always been Tuvangste. All the neighbors are and will be unfavorable to us, because they all think that they are entitled to this land. The very surname of Prus and its derivatives is repeated in Poland tens of thousand of times, not to mention the hundreds thousand others and those who know and feel their roots are in the Prusland. The history against all the odds, and dubious theories that it's not possible, is very unpredictable. For all it takes, everyone must be persistent and consequent. We also need your determination and opposition to the historical illiterates. To show that the Prusai presence have always been. Within our ranks we have Prusai in all professions, all the Prusai with their professions will be needed. Right to the end our ancestors fought for their freedom and for her were murdered . You can do it electronically. www.prusowie.pl This website belongs to the Prus people . All information in REFERENDUM are not for public knowledge and will not be. With these lists, we will go to the United Nations. We need many thousands of names.